May God fill it with Light and elevate his rank. He continues to be an inspiration. Does anyone know if Shahab Sahib left instructions for anyone who wishes to initiate Rabta with him? Faqeera, it is usually very difficult for us to initiate Rabita with the Awliya that have departed. In the rare cases where such a connection is established it is due to the initiative of the wali rather than the seeker. The best way to benefit from them is to act upon their teachings, make fatiha for them and visit their mizaarat if possible. We must remember that we do not choose where we take benefit from but it is Allah (swt) who gives benefit from where He chooses. Dear Brother I like your comments. If we want to visit his grave and say Fatiha, please let us know where he is burried. Thanks. Hazrat Qudrut Ullah Shahab Ovaisi(Rehmat Ullah Talla ) my love , my inspiration , my soul and my heart , is resting at Shakar Parian GraveYard in Islamabad. Is Dunya main aanay walay Azeem Tareen Oliya-e-Allah main say , aik azeem Wali-e-Allah , Qudrut Ullah Shahab ( Rehmat Ullah Tallah ) hain. Un ki azmaton or suchay pun ka andaza is baat say lugayain keh , aik farishtay nay ( NINETY YEARS YOUNG FAQEER ) kay farzi naam say un ki 25 saal tak tarbiaat ki or Deen-e-Islam ki hur suchai or haqeeqat un pay washgaaf or zahir kur di. Unhain woh Islam sikhaya jo , Allah or us kay pyara Rasool ka , asal Islam hay. golden words in your comment bhai. That it is Allah who arranges things! We may wish to be bayt with someone in the past -the Ovesi way- but it is not according to our Irada, however, Allah does arrange for some other teacher in His wisdom. Except perhaps the Qalanders…they do tend to take on those who are attracted to them. Perhaps God has given them special leave? What d’you think? As you know bhai there are always exceptions. Those that are “attracted” are usually those that are “called”. People do tend to be overpowered by the Qalandari sprituality and can have “interactions” with them but a genuine and active Uwaysi connection is very very rare indeed. Who are the Qalandars? How can one know if he is being contacted by the Qalandars? Waqar, the Qalandars are sufis that do not conform to outward standards. Historically this was a favorite guise of many charlatans pretending to be “faqirs”. If someone is contacted by somebody that’s passed away he would know it himself. Beware though, being in contact with spirits is not the aim of the path! Read the comments, this question has been addressed before. He lives in Canada. Works as Doctor. I think he has also an account at Face book. Would Qalandar be synonymous with a Majzoob? Is the Sufi silsila of Hazrat Lal Shahbaz Qalandar (ra) different? No its not synonymous. The majzoob is excused from following the shariah due not being in possession of his intellect. The qalandar on the other hand is not excused. As far as I am aware a qalandar is someone that is often “drowned” in Tawhid leading to neglect of outer things. That is why from the perspective of the masters both are imperfect. The more perfect the realisation the more in line it would be with the Sunnah. I don’t have any knowledge of the silsila of Hz Lal Shahbaz Qalandar (ra). All genuine silsila’s agree on the fundamentals and if you read the tazkiras men dubbed as qalandar you’ll find that were often strict in following the Shariah. 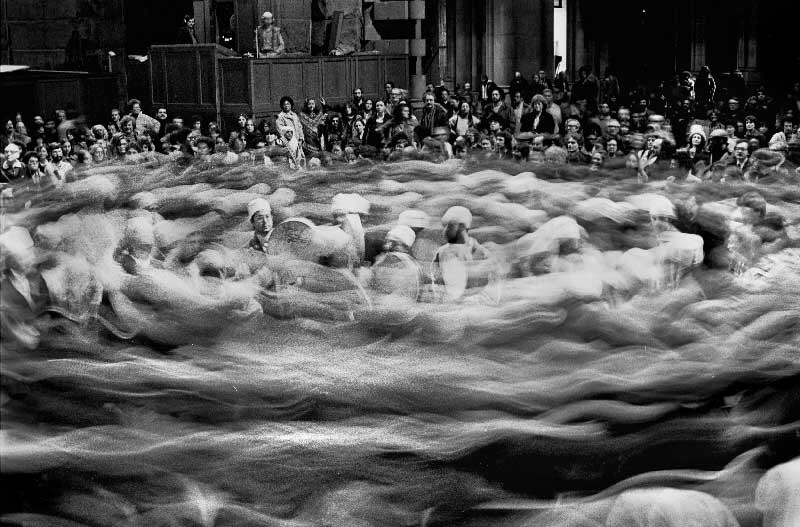 Wishing to meet Shahab sahib is not wrong…many people would love to meet some of the awliya that have departed and sometimes if the wish is strong enough one does meet them. May God benefit us by them all and grant us the blessing of seeing them. Alhamdulillah, then I pray to the one who listens all prayers, may we be blessed with Shahab Sahib’s ziarat, Ameen. May all who’s hearts yearn for him may find him, Ameen. and for the rest, may they be blessed with a yearning, Ameen. Could someone recomend me books on Auliya Allah of Pakistan or India. Dear Asma, No i don’t have a special connection with Shahb sahib and i don’t think it is necessary either. Masha’Allah if you are indeed tired of the dunya then count it as a blessing. You are already a mureed so all that remains is to follow. What God wants of us is simple and clear but we like to complicate things.If we acted more and thought and talked/discussed less we would make tremendous progress. Sorry for the delayed reply, I was without internet access. Masha Alah, Meaningful questions and apt answers too. Congratulations. May Allah grant us the Nigah-e-Karam of his Prophets and Awliya. At last I found the very special people who love Shahab sahib. He is the person , who makes me laugh, who makes me cry. God bless him. Fourth time i’m reading his magical book shahab nama and every time this great book giving me much more than i deserve. I have read almost all of his books. He is great.His writings have power to hepnatize me. Any body knows where is Shahab sahibs last resting place. I love to go their for ‘FATIAH’. Any body from england can join me as i have a plan to go to Dr. Iffat’s last resting place for ‘FATIAH’ in Canterburry not far from London. You know what i will do there, i’ll take my Shahab Nama there and the will read the Chapetr about Dr. Iffat. It makes me cry for hours and while i would be crying i will seek blessing from Allah for Shahab sahib and Dr. Iffat. GOD bless u both. May be some day i will meet Shahab Sahib’s son. I think he is heart specialist and president of some doctors organization in Canada. GOD Bless you people who disscuss my favourite personality. As i have finished Shahab Nama, i feel Quddra Ullah Shahab very close to my heart and last night i saw him in my dream guiding me to some unidentified destination. so, you dont remember the destination? I came to know about QUS when i was in First year i think in 1998. My sister borrowed a book from her college library and that book was Shahabnama. Now everything happens for a reason but i am still trying to find that reason. I read that book then and i have been reading it after that for so many times. Still i read and and try to grab something out of it that can guide me or thats for me. I wish its all planned and my aquaintance with the book is not just a coincidence. I wish there is a reason behind it. I wish i am guided this way. any one who can let me know the resting place of late Qudrat Ullah Shahab. Nice post. Can you send me an email please? Would like to ask something. Sure, drop me a line here: …………………… Better hurry though as I can’t leave this up too long. I have finished half of Shahab Nama published by Sang-e-Meel Publications, Lahore. I have found the book quite absorbing. I was 12/13 old when I saw Mr Shahab posted as deputy commissioner of Jhang. It was great to have travelled with him from Lahore to Jhang in his Chevrolet with Pakistan flag flying on the right side of his car. He was driving the car for himself. Will someone tell me where he is buried so that I can lay flowers and offer Fatiha by the side of his grave should I chance to visit the town where he lies now. Nice to hear from you. 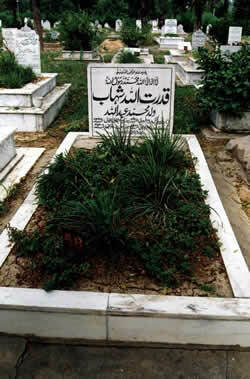 Shahab sahib is buried in Islamabad in the cemetery near Zeropoint. Entering from the main gate with the small mosque ahead you will find it in one of the rows the left, not too far from the gate. Not exact directions, I know, but if you get that far you will insha’Allah find it. Can someone PLEASE tell me about exact place where hazrat Qudrat-ullah-shahab is burried? I will be very thankful :). In the H8 graveyard in Islamabad, Pakistan (not far from Zeropoint) Read my reply to Gul Hameed sahib above. See above and you’ll find the answer to your question. thank u very much chaiwala.yesterday i have seen the grave of great SHAHAB sahb.beleive me when i intered in the graveyard from gate no 2 first of all i see the grave of shahab sahb.i was remarkable moment for me.after that i went to josh sahb grave and said fateha.now i m reading that mumtaz mufti and parveen shakir is also buried there InshALLAH next time i will visit there graves.chaiwala really u r doing a great job by guiding the shahab sahb fans.May GOD bless u.ALLAH HAFIZ. Indeed he was a great sufi, Buzurg and a wali infact. May his ranks go higher and higher in heaven. I think u people have some interest in tasawuff so thats why i am mentioning here a web address , where u can listen to the lectures of wali ullah hazrat sarfraz a shah ,who lives in lahore and u can also ask questions from him on tasawuff and also personal dua requests. Thank you for your comment. Perhaps you could share some of your experiences/observations with us? I’ve been searching for his son and finally found, his son Dr. Saqib Shahab is in Canada working as Medical Health Officer in Yorkton. But we all must respect his privacy as he does not want to be popular. Please do not disturb him, he is very busy person. do you have some more details about that property which you have mentioned? You might even know the source of that property, if that exists or existed? Anyone can leave Pakistan or his forefather’s homeland for any reason, there is no limit on liberty of anyone. At least he did not loot anything from poop people. I doubt it very much you will give a second thought if you were given a chance to quit Pakistan. What do you say? Has anyone asked about the looted-property of our incompetent leaders of the day? bank balance, foreign accounts, palaces and so on? Can you please do a favor to us all, by providing some facts about legal (and illegal) property of some or all of the following? 5) The owners of the Suger and Flour mills? list is so long that I need to stay here forever …. thank you for your time, please respect those who respect humanity. Here those who sell Pakistani nationals for dollars, who sell Pakistani teritory or sell control-of-the-teritory are also corrupt. May Allah help Pakistan. Allah hum sub ko apni razamandi wali zindagi nasiib farmai aamin. ppl i cnt xpress in words the feeling i hv for Mr Q U Shahab sahib.he was a great man wid a different type of mystc apprch.may Allah bless him,and chaiwala bahi,u r doing a great job. After reading all the comments I am really very much proud of my brothers and happy to see such kind of love for a great Personality Mr. Qudrat Ullah Shahab ( May His Soul be rest in peace Ameen ). I am also among all those lovers and wish to learn more and more from all of them. As I read one of the book of Mr. Mumtaz Mufti ( May His Soul be rest in peace Ameen )as well they all were attached in chain of Sufism. May Allah keep all of us Under His Kind Blessings. I am a huge fan of Mr Qudratullah Shahab. I visited his grave many times. Once I had a problem, I went to his grave and offer esaal e sawab for him and in heart I told him my story and would you believe he gave me answer like us mamlay k saath aisa ho ga aur doosray k saath waisa. Firstly I thought mera weham hay but as time passed away both things happened to be true. I love him so much and I will follow him always. God bless you and try to read the holy quran and follow it. To all fans and followers of Shahab sahib, when i visited grave yard of H block in Islamabad looking for Shahab sb grave i felt that he himself pointed out the exact location as some body was calling me towards that point before that i did not have the idea about his grave , I strongly wish to follow the path as told by him but its very difficult for a gunah gar,lazy person .Bhai chaiwala can you tell me if there is any khalifa of shahab sb so i could contact him. As far as I am aware Shahab sahib did not have any khalifa. He belonged to a diffrent category of awliya. These people don’t have murids or khalifas as they are primarily not “teaching shaykhs”. However one can still benefit from their ruhaniyyat. Thank you very much for reply.Please help me to to find the way in order to get benefit from ruhaniyyat(no dunyawi benefit) .After various attempts i have come to the conclusion that one must need a teacher whatsever the silsila is,as without any guide its not possible(at least for sinner like me) to improve his conduct.once again i request you to guide me. Could you please let me know where about in Canterbury the graveyard (Mrs Iffat Shahab buried) is? Khan Bhai, you can google it to find location of the graveyard. Iffat Shahab’s grave is identifiable by its direction which is different from others. I haven’t been yet but intend to go very soon, insha’Allah. There were many people as described in Shahab Nama, like Abdul Ghafoor Advocate Khushab and the people having the “Spirtual Meetings” wiht QUS. Can we not find these persons to get the way to have a contact with QUS if possible. he was an honest man and patriotic and one of the noble people of Allah. Allah almighty bless him as well as his family. Qudrat ullah shahab was a great personality and a writer. Let me very humbally put fwd my openion here. As humens we tend to follow the personality not what that personality is trying to teach us that’s why we make big mazars on there graves and many innocent ppl ….. Anyways I would suggest to follow what he wanted us to. Chai wala…thx for ur pic upload of Shahab Shahib……we love him. This is such a wonderful forum, and the person discussed is yet too great. I have read his book, read about him in Mumtaz Mufti’s books and my conclusion is that he was a gifted man and a great scholar with real vision. May Allah Bless him and give us courage to follow the right path. I went to Islamabad and but due to time constraints I was not able to pay visit his grave for Fatiha. To All the seekers of devine truth, May Allah grant our wishes! God Bless you. I am deeply impressed by his personality I got to know from his ” shahab nama” and Mumtaz Mufti’s ” Labbaik ” and ” Alakh Nagri”. I am in search of a book mentioned in shahabnama ” Zia-ul-Qaloob” written by great Scholar and spiritual leader “hazrat Imdad Muhajir makki”but has not found anywhere. Can any friend help me in finding that?? It is a great forum, Although it is my first visit today , but I feel like that I will ne visiting this quite frequently. I have read very few segments of the book ” Shahab nama” in my university days back in 1993. But in recent past , I have again read it completely with focus and consistency. No doubt , Shahab sb’s personality is like a minarit for guidence. One feels so involved and affectionate with the personality which can’t be described in words. For me it was a bit turn of life. After that I read Mumtaz Mufti’s ” alakh nagri ” , “Labaik “and “Talash”. I am deeply impressed by his characcter. The last chapter ” Chota monh bari baat ” has cleard so many things regarding basic islamic teachings. May Allah Bless his soul with rest and peace. I am in search of the book ” Zia-ul-Qaloob” By Hazrat Imdad Muhajir makki mentioned in Shahab nama but have not found anywhere. Can any friend guide me or help me in finding that book?? I will be really grateful. Qudratullah shahab! i do not know of anybody more charismatic and attractive. his list of attributes is endless. and they are all beautiful. i was first introduced to him at the age of 13 when i read a very amusing short story in a children magazine taken from his autobiography. the story was about a young muslim boy narrating his experience of taking vernacular finals with the Sikh students as he travelled several miles a day to and from the exam center on foot through a jungle. and in the process he acquired a unique scholarship with Darood Sharif. i fell in love with the writer immediately and this affair introduced me to a whole new world. Later i also found out that he was the main influence behind the towering personalities like Ashfaq Ahmad, Mumtaz Mufti and Bano Qudsia among others. In fact their children and families also benefited immencely from him. Through this blog it is good to know that his influence is widespread. QUS had a special interest in the younger generation and he understood them better than anybody else. he was kind, generous, ingenious and wise when it came to offering advise to them. I wish those youngesters (probably now in their late 40s) who had the privilege of interacting with him also share their personal eperiences with us so that we, the current youngsters, can also benefit from him and find balance and harmony in our lives. i think what QUS has done as a pakistani muslim, we may not find its match. he is the champion of champions! following his example is exceptional although i feel more close to mumtaz mufti who is immersed in reverance. when i visited islamabad a long time ago, i had the honor of paying a visit to this true savant of Islam. i saw that their were many red flowers growing on his grave. i plucked one for myself as Tabarak thinking that normally we bring flowers to the graves of our beloveds but sometimes it also happens that you are handed one when you visit a very special one! may allah bless his soul and bless us with the likes of him. Zia ul Quloob is still available but in the collection called Kulliyat e Imdadia. I have not seen it published on its own. I am really pleased and grateful on yours guidence regarding search of the book. I will look for the book you mentioned. I m the new comer in this group QUS followers so kindly help me to go ahead in this path and also lead me if any body has any information about Mumtaz Mufti. Welcome Zakaria bhai, what did u want to know about Muftiji? I just wanted to know, If anyone know the exact location of Hazrat Qudratullah Shahab’s Grave? I want to visit him to pay my tribute. I will be very much thankful. main jub 13 saal ki thi tub pehli dafa q u shahab ko parha. me fan ov him. ashfak ahmed, mumtaz mufti nd shahab sahab say main nay apnay dil ka chour pakarna seakha h.
ap bohot khosh naseeb hen k itni chooti umar me great peoples ko parne ki tawfeeq hui. me to graduation tak unka sirf nam janta the lakin is me mera qosoor nahi he mera gawoo itni dur daraz elaqe me he k wohan library nam ki koi cheez abi tak nahi. lakin me ne ab erada kia he k wohan ek library qaayum karoon take mawjooda nasel ko wo mushkilat pesh na ayen jo hamen sehna parhe taleem k silsile me. laikn abi to me khud student hon ye erada future ka he. Tony, Salam! Just a small correction, as far as I know QUS was not acquainted with Shah Jee. However Mumtaz Mufti who was close to QUS became quite close to Shah sahib after the passing of QUS. Regardless of this Sarfraz Shah sahib’s talks are well worth listening to. Also i will like to request to all members to please give links about any info which can lead to Qudrat Ullah shahab or Mumtaz mufti or any other. i need the date of javed chaudhry’s column in which he has penned the last interview of mumtaz mufti… and there is some reference of Syed Sarfraz Ahmad Shah Sahib……..a great intellectual and sufi. Qudrat Ullah Shahab. He was a Man in this world who Change the History… His Qualities Near to Nature, If someone wants to understand Nature, then he must Read his Book “Shahaab Nama” not only once time, Read Again and Again, till now some of secrets things inherit in your Body… I”m not lie… Try it if you want something from Nature……. In book of Mumtaz Mufti “Labaik” there he pointed out a great intllectual and sufi to Professor Rafiq Akhter not Sarfraz A. shah. i pray for shahab sb and iffat maan ji Allah bless them. i request to all muslim plz pray for tham. thanks. When i completed shahab nama i came to know that he is with me. shahab is my soul and is guiding me. I hope all the readers will not take shabnama just as a book, it’s something more than it. i think everybody should follow the advices which were given to shahab himself. 1- dont say anything about a person behind him which you could not say before him. 2- always guard your character. This is a must read book for every Muslim of subcontinent. It is worth even if you need to learn Urdu just to read this book. InshaAllah this will be my efforts for my US born son. Shahab sahab’s experiences about system, history and the mentality of people is very much supported by other reliable sources and my personal experience. I became his fan when I read this book first time in 2001. Since then I have recommended this book to many others. I wish if I can have a competition to award some prize based on questions from this book after making this book available. Wish my ‘Nienty’ will help me. I recently read Labbaik and now reading Alakh Nagri. Can anyone please convey my Salaam when you visit final resting of Shahab sb, Mumtaz Mufti sb and Dr Iffat Sahiba? May Allah give you reward for that. I Read two times “Shahab Nama” with full attention.I am very very impressed to his personality.I love him very much.He is my spritual Teacher.He is died before my birth.so I visited his grave yard in Islamabad. I prayed for him,he get a good success in Akhrah. aoa chaiwala plz tell me who r u? main sochti the k main shahab sahib ko aur un kay taam dostoon ko bohat pasand kerti hoon lakin yahan aap sab logon kay comments pernay kay baad ehsaas ho raha hai k main kis qader kam ilam hoon aap sab ko salaam aur khasosi toor per chaiwala ko ALLAH jee aap sab kay darajat ko buland karain ameen. Naadia, as-salamu alaykum. Comments ke liye shukriya. Allah Pak aap ko jaza e kair ata farmaye aur dunya aur akhirat mein kamyaab farmaye. AOA sir aap nay umeed kee khirkee khool ker aik daam band keyoon ker dee . Thses are life changing lectures . assalamu alikum Nadia, umeed ki kiren jb rowshan hoti he to shola bnte deer nahi lagti. chaiwala ko koi majbori hogi warna wo zaror response deeta. ap apni sawal k jawab k lie Ishfaq Ahmad shb ki Zawia dekhen,jahan tk Zawia k zarie me ne samja he wo apko bata deta likin agar ap khud deken ge to or b bohot kuch ap ko mile gi.apni duawon me yad rakhie ga.
wa alaykum salam, v sorry mager mein ne aap ka suwaal abhi dekha ha yani, ikhlas aur tawajjuh kaise paida ho. Insha’Allah bohat jald is per kuch post karon ga ta ke aur log bhi parah sakein. For now, Shahabiyat ke label ke teht jo jeezain post ki hein woh zarur parhein esp nimaz ke mutalliq. Aik baat zaroor zehn mein rakein ke mein koi aalim, sufi ya dervish waghera nahin balke aik talib ilm hoon. apni du’aon mein yaad rakein. 1. Mohtarma Atiya sahiba who is she? and where is living now? 2. Janab Siddique raii Sahib. Mumtaz Mufti told in his book Alakh Nagri that Mr. Siddique Rai was only person who was resived guidance in filed of Tasawwuf from Janab Qudratullah Shahab sahib. ( and may be after Shahab Sahib death) where is he living now? I dont have the number for Shah Sahib. The best way to reach him is via email from Shah Sahib’s web site. Shahab sahib is one of my favourite author.He is not only an author but a great man , a guide,a spritually strong person.i love him & want guidence from him.May Allah bless us as he blessed His pious men. dear brother have u a contact no. of Akse Muftee sb? No, I do not have the contact no for Aksi Mufti sb. Many people ask for the contact details of Saqib Shahab too. They do not understand that children of great people are not a replacement for them and not necessarily on the same path either. It is good to love people like Shahab sahib but one must remember that their legacy is their teachings which we should try to act upon. I do agree with u.thanx 4 ur concern. can any one tell me about Janab Siddique raii Sahib. Mumtaz Mufti told in his book Alakh Nagri that Mr. Siddique Rai was only person who was resived guidance in filed of Tasawwuf from Janab Qudratullah Shahab sahib. where is he living now? Mujhe ye jan kar khushi hui ke Shahab sahib ke itne chahne wale maujood hain, bila shuba Shahab Sahib ko wo muqam hasil hai jo kisi aur csp offr ko naseeb nahin hua. May his soul rest in peace. Shahab sb him self is a light,Shabnama is also the secret of spirit.There is something in it which opens a path of light only one can understand who experianced it.Read his book with clean hert and God will reveal. Shahab Sarkar is a Beacon ov hope nd light..Kaash mjh jese Kamtar bhi unki nazr-e-karam k qabil ban sakein. Hello every one if you want any guidence regarding Sufism you should read Quran with translation Shahab Saab also used to read Quran translation throught his life This is the teaching of Shahab. Pls read Choota moon bari baat chapter of Shahab Nama where he (May his soul rest in peace) recommends every one to read Quran translation daily. assalamo Alaikum: I visited graveyard near to 0 point at Islamabad and prayed offer for my Aqa Janab Qudarullah Shahab Sahib. He is a very humble to me and refer to me to go Salar wala at Faisalbad to meet with the my Rohani Peshwa Janab Hazrat Abu Anees Mohammad Barkat Ali (QSA) to get the faiz from him. I obey the orders and Alhamdulillah, a lot of Faiz of my Rohani Peshwa is showering at me day and night. This is a great Ehsan of my Aqa Janab Qudratullah Shahab Sahib and I am thankfull till my present death. Aslamo Alikum……Today is 14 ramdan and i m studying Shahab Nama from previous 2 days …Today i was studying Rozgare Safeer ……and there is refrence of book Zia-ul-Quloob ..i am searching that i face ur comments ……..i dont know unintentionally i have tearsin my eyes after watching all of ur comments………but still my interst is not developing in Shahab Nama…..
Don’t worry if you can’t read Shahab Nama….the man was more impressive than the book…in any case in Ramadan it is better to devote as much time as possible to ibadaat such as tilawat of the Quran, zikr etc rather than to reading books. The surest way is to allow this talab to grow in one’s heart and continuously ask Allah to lead one to someone from amongst His chosen servants who can guide one to Him. The shaykhs usually recommend the follwoing du’a for this purpose: ” Allahumma dullani ala man yadulluni alayk wa awsilni ila man yusiluni ilayk”. It is good to make this du’a after every Fard salat three times and at other blessed times such as the time of tahajjud/sehri. One of the recent awliya echoed what the great shaykhs have always said: “murid e sadiq banu, pir khud mil jaye ga”. GOD BLESS SHAHAB SAHIB. THESE KIND OF PEOPLE ARE RARE IN THIS CRUEL WORD PARTICULARLY THESE DAYS WHEN HYPOCRICY IS AT THE BOOM IN PAKISTAN AND FLOURISHING WITH E DAYS. shahab sahib k tamam chahne waloon ko ALLAH slamat rakhe. ALLAH TA AALA ajjar atta kare. I am quiet amazed to see rush of comments on this forum. I am delighted to know sea of people who wish to follow the path of Qudrat Ullah Shahab R.A, but knowing about him, I extracted that he himself believed in “Identification with Prophet Muhammad SAW(PBUH)”. I am myself attached to Silsila e Owaisia and residing in Islamabad, but couldn’t get a chance to visit his grave. All those who plan to go to the grave of Shahab Sahb’s RA grave, don’t go there bare-handed. Try to recite Darood-Sharif as much as you can to gift as aisaal e sawab to Shahab Sahb RA. Trust me, it will make him happier. Dear Chaiwala or any other Allah ka banda jo mere madad kar saka, I am in a problem (sipertual problem) and in a dire need of guidance. Noman Ali, thank you for dropping by. When does a muslim become great enough for us to ask for the descent of God’s mercy upon him and since when have the less great or even sinners been excluded from it? yehi tamaam AMBIYA(a.s) ka tareeqa raha hai…. Qudratullah sir k bary min kia khun wo khud shahan namey ki surat min 1 thara se zinda han or jab tak un ki book read hoti rhe gi tab tak wo humare darmyan zinda rhen gay.un ki book par k aysa laga k min par nai rha when khen par hun jhan wo likh rhe han. bus ye he dua hai k Allah un ko apne han se 1 uncha muqam de.ameen. I read Sahab naama first about 20 years back and since 3 years ago I had urge to buy it but i didnt, even thou i had chances to buy it, until i was in leaving karachi and I went to bookshop at karachi airport for buying some thing else and then asked shopkeeper about shahabnamma and he gave 1 copy to me and i bought it. My life is completly changed since then and the man was great abd his work go thru all of us via his book. That is a sufi effect via book. His book is his Khalifa. The more you read it the more you get educated. i have been longing to see the holy Grave of this saint like bureaucrat. Such people are the assets to a country. History and especially the Urdu Literature can never forget his literary services. His literary master pieces are unforgeable. His writing style particularly use of ASY and JASY make him alive perpetually. asa, is there any one who can contact Saquib Shahab , Bano Qudsia, Shima Majeed and other close to Shahab sb, requiting complete compilation of a desperate booklet of last chapter of Shahabnama. All other such maulat / zikr advised by Shahab sb existing / available in different books. All such spiritual motivational material should be available separately compiled. Duaa ha Allah sub ko assaniyan atta karay or Assaniyan taqseem karne ki tofeeq atta farmaye Ameen…. Sohail bhai, thank you for your comments. Khuda aap ko khush rake. Aik bare buzurg ka irshad hai ke “Rijal Haqq se pehchane jate hein, Haqq rijal se nahin pehchana jate”. Is ka matlab ye hai ke hamein talash aur talab sirf Khuda ki rakhni chaheye kisi buzurg ya silsila ki nahin kyon ke ye sab zarai hein aur ye Khuda hi janta he ke hamare liye kiya behtar hai. Dear Brother , Can you kindly help OR advise , for the possibility of getting a complete , seperately compiled booklet , of last chapter of Shahabnama. Along with all other such mamulats/zikr, Dua,advised by Shahab sb. Present it exist/ available in different books. If it is compiled in a seperate booklet, it will be highly helpfull for those seeking guidence in this regard. AOA Thanks a lot Chaiwala Bhai 4 such nice quote. Ap ne theak kaha k humen humesha Allah ki talab or talash karni cahiey. But ap tu jantay ha na k Allha farmatay ha k meri Rassi ko mazboti se tham lo….jahan tak ye smjha aata ha Rassi mean Quraan-e-Pak , Nabi kareem S.A.W n after that Oliya Allah….m i ri8???? Bhai meri soch es mamlay ma just ye k jistrha ka mai monh bola muslman hon ma kisi assay insan ko he mil lon k jis se Allah n Nabi-e-kareem S.A.W mohabbat kartay ha tu ye boht bari kamyabi ha….agar ma kisi assay insan k sath just betha howa hon ga or os waqt AAQA S.A.W ki Nigah-e-Karam shayad mujhpe b parh jae….mery lie itna he kafi ha. Coz I blv AAP S.A.W ki nigah-e-karam se taqdeereyn badal jati ha…..Nabi-e-Kareem S.A.W ki nigah ho n Allah ki talab n talash dil ma na aye ye mumkin he nhi…..
MPORTANT: Please wite full “sallallahu alayhi wasallam” with the Prophet sallallahu alayhi wasallam name. Don’t use abbreviations.It is Disrespectfull and the Ulema also says to write full Blessing not the abbreviations. Please “sallallahu alayhi wasallam” pura lika karein.Adhe lfz na likha karein ke Shan-E-Nabi sallallahu alayhi wasallam ke khilaf he.Aur ulme karam bhi yehi khte hein. Qudrut Ullah Shahab Ovaisi ( Rehmat Ullah Talla ) woh khush naseeb insan thay jin ki tarbiat 25 saal takaik farishtay nay , Ninety Years Young Faqir nay ki or suchay or Islam kay baaray main saari suchayan saaf saaf byan furma deen. Khalis Islam ko phhir say khol kur byan furma diya. Very well said. All these books are worth reading. It is advisable to have these books in home and should be share with all family members. Young generation should read it also & shouls also know thsi network.My Son Abdullah, is free now a days after his O Lavel Exam. I advsie him & motivate him also to read it. Al Hamdo Lillah, he is reading it. I have no words for this great person…..I just love him. Qubron ki ziarat kurnay jaanaa kesay islami kaam nahee hay ? kindly sub bhaiyon se request ha k metaexistence.org website ko lazmi read karey. ye dajjal k baray ma kafi important research ki gai ha…. May Allah bless him more in Jannah.I respect him a lot because he was real Ashiq e Rasool SAW.Hazrat Muhammad PBUH our beloved Prophet.I Love Him more than any thing in this world. Hz Qudrat ullah Shahab is really a great inspiration for us……… i wish to follow the path he showed us in last chapter of his book “chota Mu bari baat”… chaiwala bhai QUShahab mentioned in this chapter about Hazrat Mahjar MakKi ‘s Book… “zia ul qaloob” . please…Can u please guide me about it.. and the ways how can me strengthen our faith? If you wish to contact Qudrut Ullah Shahab Ovaisi ( Rehmat Ullah Talla ) than just start reading DAROOD SHAREEF every day and lead a pure and honest life. Occasionally you can read some Quran Pak and darood shareef for him as well. Try to speak as less as possible. Never ever lie. Eat as less as possible . Be very very very very good with other human beings. Never hurt any one with your tongue or with your acts. Than see the magic. In the last chapter called ( CHHOTA MUNH , BARRI BAAT ). These all are extremely effective wazaif which were told and tought by his holy guardian angel ( Ninety Years Young Faqir ). The way of Qudrut Ullah Shahab (Rehmat Ullah Talla ) is 100 % way of Allah and His last beloved prophet Muhammad ( Sullaho Alehay Wassalam ). He was tought by his holy guardian angel NINETY YEARS YOUNG FAQIR exactly in the way and wish of Allah Kareem. Any thing in ISLAM other than teachings of Qudrut Ullah Shahab ( Rehmat Ullah Talla ) is false and man made. Sunnis are right , Wahabis are on correct way or Shia are on correct path. You discover the real truth and 100 % truth.Only Qudurt Ullah Shahab (Rehmat Ullah Tallah ) and his way is according to Sunnah and. guaranteed , true and success ful path. Ejaz bhai…i donot agree with you…i believe qudratullah shahab sahib was a great sufi/personality…there is no doubt abt dat…bt if you say his way is 100% correct is not true….deen ek tree hai…aur sab fiqh is ki branches hain…surely Allah knws best…prophet pbuh said in his last sermon…..
Verily I have left amongst you that which will never lead you astray, the BOOK OF ALLAH, which if you hold fast you shall never go astray. And beware of transgressing the limits set in the matters of religion, for it is transgression of religion, that brought destruction to (many people) before you. Dear Brother Muhammad Sahib , I agree you. In fact what you say , is also my point. Now-a-days , We have so many differences among Muslim Ummah , every one claims to be on right path and deny that others are also following righteous way. Teachings of Qudrut Ullah Shahab Ovaisi ( Rehmat Ullah Talla ) work as a Judge to determine who is on right path and which way we must avoid. Exactly ! Brother you are right . With pleasure , I shall add here that Seerat of Qudrut Ullah Shahab ( Rehmat Ullah Taelaa ) is 100 % in accordance with that of Seerat Mubarak of Nabi Akram ( Sul lal laho Alaihay Wassalam ). There are absolutely no contraries in it. To us, It is a relationship of love and respect with a man who was so much loved and blessed by Nabi Kareem (Sul lal laho Alaihay Wassalam). Who revealed us the blessings of DUROOD SHAREEF coating his very own examples.Qudrut Ullah Shahab ( Rehmat Ullah Taelaa ) gave us an enthusim and encouraged us to walk in the way of Allah. He revealed us how blessful is it to recite Durood Shareef every day . He conveyed us holy instructions of very holy entitiy ” Ninety Years Young Faqeer ” . He helped us with his superior knowledge of Islam. He tought us what we did not know. He tought us DUAI KUN FAA YAA KUN. With his gudiance , we could avoid so many transgression in our life. I am highly highly thankful to Qudrut Ullah Shahab Sahib. I have made use of his DUA KUN FAA YAA KUN intensely in my life. It has helped me immensly. No post by chaiwala bhai for sometime? i lived very close to Shahab Sahib’s grave at I-8 which is very close to zero point Islamabad. I often go their as my Grand parents are also burried in the same Graveyard…..May ALLAH Tala rest their soules in peace and give us strength to follow Shahab Sahib’s path. Amin. I am one of those who are deeply moved by Shahab Sahib’s life; I too have cried on reading the Shahabnama, As a fellow civil servant I realize how difficult it is to survive in the rather evil corridors of government. May Allah grant him the choicest place in Jannah and fill his grave with light. 1- Durood Shareef , Every day 11 times. Very regularly. This Dua is most wonderful Dua. It was tought to him by an entity called NINETY YEARS YOUNG FAQEER.This entity was also his teacher for almost 25 years. Most probably , He was his Holy Guardian Angel. This Angel tought him Real Islam of Nabi Kareem ( Sullalo Elehay Wasalam ). Any one seriously sick , un employed , in hardships , financial problems , or is seeking good relations for his daughters or sisters , Please recite this Wonderful Dua. It is extremely effective. Very very very effective. Please recite is as Our beloved Murshid Hazrat Qudrut Ullah Shahab Ovaisi ( Rehmat Ullah Talaa ) has narrated in instructions at the very last page of SHAHAB NAMA. I was so amazed to see my own message posted on this form in 2008 (August 5, 2008 at 9:40 pm) while I was in England. Love you guys, at least with your company; I can make assumption that I am not abnormal, a mad man running after fantasies and gladly, not alone. Just updates, from England, I moved to Canada and I am in contact with Dr. Saqib Shahab Sahib. I will not go in to the details but he is a great man like his dad. Such a wonderful, ground to earth person. Initially when I fell in to this strange relationship with Q A Shahab sahib, i thought, due to the home sickness as being away from home (Pakistan), I am actually suffering some sort of stress, which is strengthening this mental state. But it’s been over 5 years; i couldn’t surface myself from this realm. I should say at this point that it will never go away and you know what, I love to be in this state. This ‘State’ can’t be explained with words. I’m thinking and seeing Q U Shahaab Sahib , not as an individual but a movement, a movement of truth and glory of Islam and Pakistan. I can see this movement is attracting people across all fields of life. It was meant to happen and it’s happening now. I am still lacking an organized platform where people like you, can actually inspire the whole nation. Allah bless you all and wish you all the best. i so much happyn excited today bcz i m going to chat wd a prson who met dr.saqib sb.my pleasure cnt b explained in words.i visted this page ist time bt glad to know ..k tm hi nhi tnha en aankhon k dewaane hzron hn.. i m in weaping while writing these lines k khwab hqiqt m bdl gya.bss m ho to m fly kr k dr sahib ki zyart kr ln.m apne jzbt ko byan kr skn. bs dil krta h k hr bnda QUS sb ko zrur prrhe Allah tala un k sadqe m hme b eman ki esi daolt nseeb kre.bs ek request h k agr ap es rah m koi roshni dekh chuke hn tozrur btyn Allah tala ap ko es k ajr ata frmye ga. This is most wonderful DUA and an out come of 50 years of personal hard work and personal experiences of Hazrat Qudurt Ullah Shahab Sahib (Rehmat Ulla Talla ).Please make use of this DUA for every need of your life. It is most amazing treasure. Most valueable and most effective. Most most most most wonderful DUA that an human being can imagine. aslam o alikum, bhai mujy qudrat ullah shab shab ki qaber ka adress chaye koi khata hai h8 main hai loi khatha hai shker parain main ahi to plz conform btain k khan pe hai thanx.